TimeTrak Knowledge Base provides businesses with field staff the ability to access vital information they require as if they were searching for it at the office. Our knowledge management solution enables a company to have one platform where information is stored; reducing double ups of paperwork, while providing seamless sharing of critical site information, client documentation, drawings or parts information, or any information your staff require on site. This software gives a company the ability to store and share knowledge in an open forum, allowing staff to find the information they need, when they need it and wherever they are. A knowledge base can be used as a business tool to keep company, client or product information visible and accessible to staff or selected groups of people, as well as giving the opportunity for knowledge bases or articles to be visible but locked so that they are uneditable. As our Knowledge Base is built into the TimeTrak database it can be used from anywhere and will never be lost. With full integration to the entire TimeTrak Suite, your team can access, edit and link articles to various other areas of TimeTrak. Articles can be linked to jobs, clients, contacts, assets, other articles, plus more. 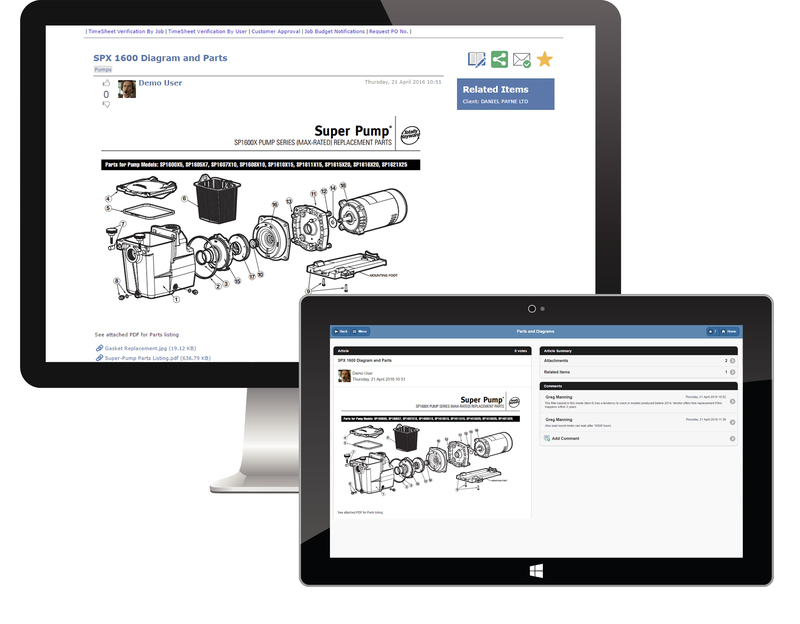 Locate product schematics, client building plans or troubleshooting documents from the field. Subscribe to topics or clients for quick access of information while on client sites. Link articles and questions to other articles, questions, clients, contacts, jobs or tasks. Create articles or questions about a client site, product or other topic to gain the right knowledge from the experts in your organisation. Knowledge Base is a great tool to increase understanding across a range of topics, using the experts from your very own business. Better team communication through a centralised information hub. Ask, answer, write, comment or search - all the information you need is in one place. Locate product schematics, client building plans or troubleshooting documentation from the field or the office.